Lock in a great price for Churchill Hotel Near Embassy Row – rated 8.6 by recent guests! The room is spacious. There are 2 free bottles of water, Italian coffee Lavazza in the room. Quite a big TV. There is a good restaurant at the hotel. Although the choice isn't huge, but the food is very good. There is a free coffee in the lobby every morning. The best part, is that they allowed us to check in approx by noon! Thank you very much! It’s clean and quiet despite being right by the road. This was a swank hotel that had a lot of nice appointments. The two nights that I stayed were quite comfortable. We did not have occasion to use the food service in the hotel as most of the meals for the prayer breakfast were provided. Super clean! Convenient to our event st the Hilton and lovely walk down Connecticut for restaurants. - We booked delux king suite room which is very big. There are 2 TVs in the room, one in the bedroom and one in the living room. We like it a lot because we can leave our son sleep in the room and watch movie outside without waking him up. The room is very clean. ***Highly recommended for family with allergy. - Same price as Courtyard Marriott with bigger room. The room and the furniture was tastefully designed and the bed was so comfy. I also loved the shower! The renovations have turned a comfortable old hotel into modern, luxurious, but still very comfortable one. We love the new decor! Everything. The location could hardly be better and I got an excellent special room rate for my dates there - which I undestand is given from tine to time. Spacious and clean room with comfortable bed is the best after walking around in the city. Price is still affordable side in this city. Churchill Hotel Near Embassy Row This rating is a reflection of how the property compares to the industry standard when it comes to price, facilities and services available. It's based on a self-evaluation by the property. Use this rating to help choose your stay! 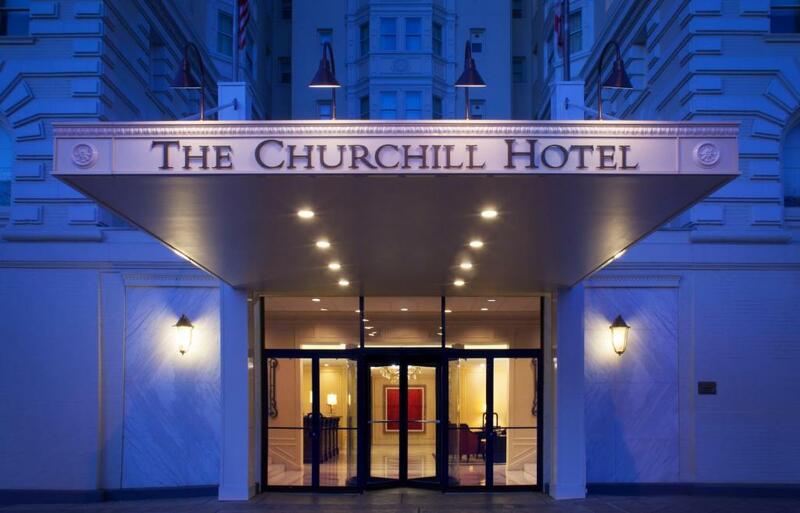 Standing more than a century in Washington D.C., The Churchill Hotel Near Embassy Row is 2,650 feet from the Dupont Circle Metro Station and Dupont Circle. The property has a restaurant and offers Starbucks coffee onsite. The rooms at the hotel feature a flat-screen cable TV and a seating area or a work desk. The windows in the rooms open and guests will also find iron with an ironing board in the rooms. The Chartwell Grill and Lounge serves breakfast, lunch and dinner, every day. The lounge is open at night for snacks and cocktails. The Grill serves a traditional American fare. A fully equipped fitness center and in-room spa services are available to all guests of The Churchill. A business center and valet parking are also offered along with complimentary WiFi. The White House is 1.4 mi from The Churchill Hotel Near Embassy Row and The Phillips Collection Art Gallery is 1,600 feet away. Smithsonian National Zoological Park is 1.1 mi from this historic hotel. When would you like to stay at Churchill Hotel Near Embassy Row? This spacious room has a flat-screen TV. Private parking is available on site (reservation is not possible) and costs USD 50 per day. This spacious suite has separate sitting area with a flat-screen TV and desk. This spacious suite has separate sitting area with a flat-screen TV, sofa bed and desk. This room features a separate sitting area with a desk and flat-screen TV. Some rooms can accommodate 3 guests for a charge. House Rules Churchill Hotel Near Embassy Row takes special requests – add in the next step! Churchill Hotel Near Embassy Row accepts these cards and reserves the right to temporarily hold an amount prior to arrival. Please note, not all rates include breakfast. For breakfast-included rates, breakfast is limited to 2 guests only. Additional guests, including children, will incur additional breakfast charges. 134 people are currently looking for a place in Washington, D.C. When I got confused with my payment the stuff explained me very well until I understand. It was nice bathroom. Spacious and clean rooms, nice and quiet location. Very good price for what you get. That the price was a little difficult. Online say you’ll pay this much but when you get there the taxes be extra high! Bed is comfortable, clean service is great! Person who helped get our car and load bags was rude to bellhop, talking down to him like he was a child because he forgot to write the room # on our valet ticket. If he wanted to correct him, he shouldn’t have done it in front of customers. Bed was comfy; nice location, food was good. My room was not cleaned. It had dirty socks left in it, hair ties, and hair in my shower. The sink didn’t drain water. The second night of the stay A/C stopped working and the stuff wasn’t very helpful, we had to call them twice and then go down to see if someone would come to see what was going on, it took over and hour till someone came up to see and fix the problem... Stuff is not very pleasant nor friendly. Location. Beautiful hotel. Beautiful room. It would be nice if they left the coffee out in the lobby later. Parking is tough in the area. Valet is available but expensive.